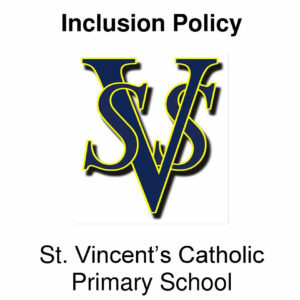 St Vincent’s values the abilities and achievements of all its pupils who are unique and made in God’s image. We are committed to providing, for each pupil, the best possible education and environment for learning. 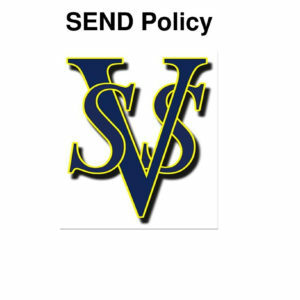 We aim to maximize the progress and achievement for pupils with SEND through an enriching and rigorous education. We aim to support the pupils to become confident learners in life and achieve the greatest independence possible in their learning. We are committed to becoming a sustainable Rights Respecting School and endeavour to uphold the values and principles of the UNCRC. 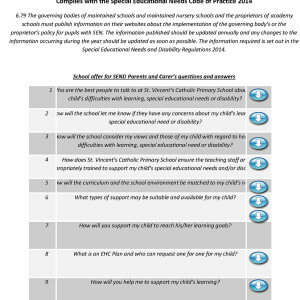 Mrs Duffy is the Special Educational Needs Co-ordinator (SENCo). 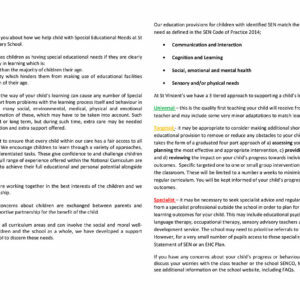 If you would like to discuss you child’s needs please arrange an appointment with the school office.